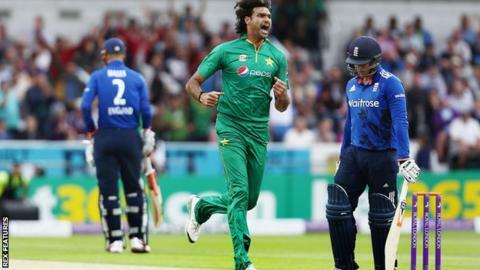 Pakistan fast bowler Mohammad Irfan has been banned for a year by the Pakistan Cricket Board for twice failing to report approaches by bookmakers linked to spot-fixing. The 7ft 1in bowler was one of three players suspended following an anti-corruption investigation focused on the Pakistan Super League. Six months of the ban will be suspended if Irfan, 34, fulfils certain conditions imposed on him. He last played for Pakistan in 2016. Internationals Sharjeel Khan and Khalid Latif, who both play for Islamabad United alongside Irfan, have been provisionally suspended. Left-arm spinner Zulfiqar Babar (Quetta Gladiators) and opening batsman Shazaib Hassan (Karachi Kings) were also questioned by the PCB's anti-corruption unit. Irfan, who has played Test, one-day and Twenty20 cricket for his country, last appeared for Pakistan in an ODI against England at Headingley in September 2016. Half of his ban will be suspended if there is no further breach and he will also be required to take part in an anti-corruption education program. He was also fined one million Pakistan rupees (£7,680). Pakistan batsman Nasir Jamshed was one of two men arrested by the National Crime Agency in Britain in February as part of an investigation into cricket corruption. A third suspect was also arrested in Sheffield and all three were released on bail.